The classic Volkswagen Camper Van has been given custom paint jobs for almost as long as it’s been around. Admittedly, the vast majority of those alterations done by the free-loving, tie-dyed and Deadhead crowds. 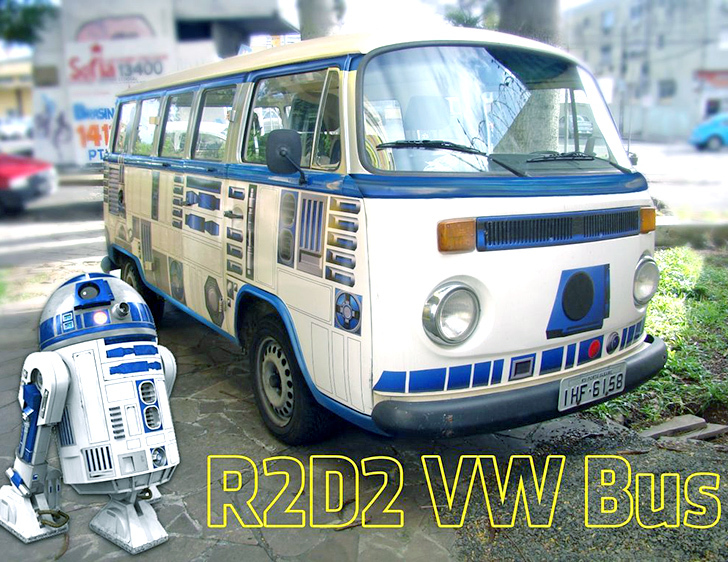 But mimaki cg60—an Instructables user in Brazil—had slightly different plans for his family’s beaten up VW; as he puts it, after a marathon viewing of Star Wars he found exactly the droid he was looking for. About 50 hours of Photoshop work went into recreating all of R2-D2‘s various components, which were then printed onto vinyl to provide a modular custom car wrap. The project isn’t quite finished yet—so if you have thoughts on hubcaps, or whether or not a Millennium Falcon should be added atop the bus, head over to mimaki cg60’s Instructables page! The classic Volkswagen Camper Van has been given custom paint jobs for almost as long as it's been around. Admittedly, the vast majority of those alterations done by the free-loving, tie-dyed and Deadhead crowds. But mimaki cg60—an Instructables user in Brazil—had slightly different plans for his family's beaten up VW; as he puts it, after a marathon viewing of Star Wars he found exactly the droid he was looking for. About 50 hours of Photoshop work went into recreating all of R2-D2's various components, which were then printed onto vinyl to provide a modular custom car wrap. The project isn't quite finished yet—so if you have thoughts on hubcaps, or whether or not a Millennium Falcon should be added atop the bus, head over to mimaki cg60's Instructables page!